Sanctum Sanctorum Comix: MYSTIC GARB : DR. STRANGE APPAREL - part 5 : "THE END" OF GARMENTS! - part 5 : "THE END" OF GARMENTS! Welcome back, to this, Part 5 of a series of posts that will seek to catalogue my extensive collection of Doctor Strange (and related 6-Dimensions characters) apparel! can be found at those links. MARVEL UNDERPANTS : BOXER SHORTS STYLE! This is the shot from the back-side of the shorts. The front is exactly the same, but this view is less broken up by the wang-window. 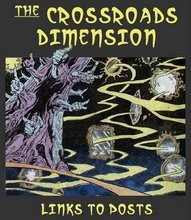 DOCTOR STRANGE, as drawn by Marshall Rodgers, can be found on the far right, between Psylocke and Jean (Phoenix) Grey. While not present on the outside of the garment, there is, when worn, a "Giant-Sized Man-Thing" may lurk inside of the boxers. Yes. I made "that joke". Everyone does. So sue me. No. Seriously. Oddly enough, while nearly every character who ever had his or her own title is represented on these boxers - the Macabre MAN-THING is conspicuous by his absence. Could it have been a deliberate decision? Was it ever heard in some design room; "Ye GODS man! What do you think you're doing? 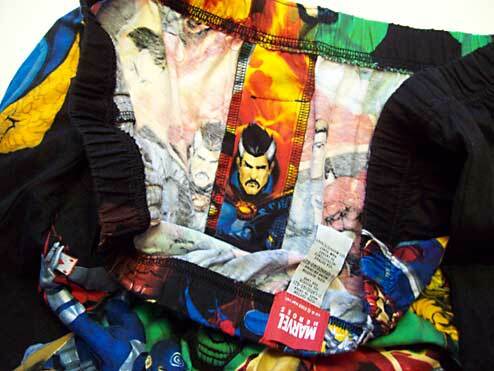 You can't put the image of a character who is called 'Man-Thing' on men's boxers! 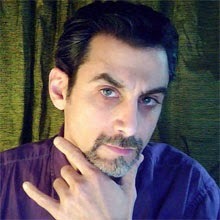 You just jumped from subliminal, past liminal straight to super-liminal! Do you want Tipper Gore to bring the hammer down on us? Erase it! ERASE IT - NOW!!!" eh. Maybe that never happened. Notice DR DOOM and RED SKULL are up to no good in a very "inappropriate" area. No good can come from that. These boxer shorts were purchased in 1995, although the tag states that they are copyright 1994. At one time or another, everyone who gets to know me well enough get to know what kind of insane DOCTOR STRANGE fan that I am, and they sometimes take it upon themselves to be on high-alert to inform me if they see ANYTHING with the good Doctor represented thereupon. 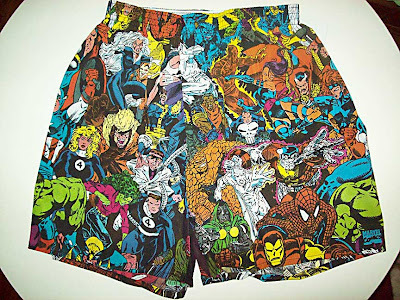 One day while I was at work (back in those days, it was at an Antiquarian BookShoppe / Comic shoppe), and one of my work-buds calls me up to tell me that he sees Doc on a pair of UNDERWEAR at a local store, and that if I want them (if I didn’t ALREADY own a pair - he couldn’t know for sure), that I should hustle on down quickly, since there were only a few remaining. So, I immediately took my lunch-break and drove quickly (minding the posted speed-limit, of course) to the store (K-Mart... iirc). There were three pairs remaining, two men's and one boy's, so I bought them all. The plan being to wear the two men's pair and save the "boy's small" for my collection. When I took them to the register to pay for them, the LOOK that the woman behind the counter gave me was PRICELESS! She looked at me warily, like I was using these things to lure young boys to my van or something. I wasn’t sure if I should tell her that they were for ME or not (with the explanation that I’m a collector of a weird comic character and that, yes, even boys underwear are fair game…), so I just paid for them and got the hell out of there before she could trigger the silent alarm. Ahh… the things I have done for my collection. 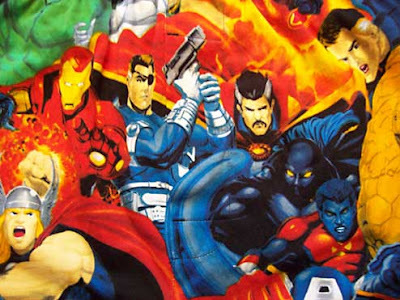 Made by BRIEFLY STATED in 2010 these shorts feature a who's-who of Marvel characters. A detail of the shorts shows Doc next to his old Strange Tales book-buddy: Nick Fury! 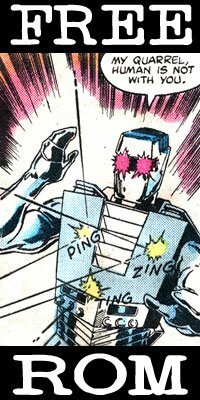 The very fact that Nick Fury's GUN and Mr. Fantastic's "stretchy-parts" are on the wang-window is a little disturbingly "coincidental" for my tastes. he is placed strategically on the wang-flap. Cool? - or - Disturbing! : YOU DECIDE! 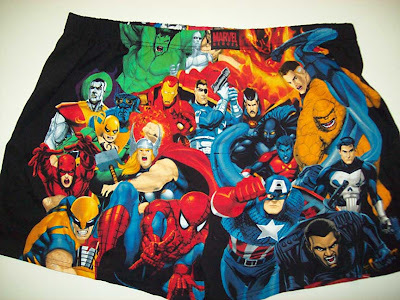 While the front of the boxer shorts seems to have all of the heroes who either HAVE HAD, or in the case of Doc (and Iron Fist and Black Panther), WILL HAVE a film deal, the rear of the shorts is just a mash-up of various villains, some having had movie incarnations and others... not so much. Or at least, not yet (lookin' at YOU Hobgoblin, Lizard and Sentinals... and I'm not sure if that cloud in the 2nd FF movie ever counted as Galactus). Lizard seems ready to do a proctological exam with that tail! I should give proper thanks to Howard Hallis, once again, who saw these in a WalMart and, as the awesome friend he is, bought one for me as well. Good thing, too, because I happened to have been in a WalMart a few days later and these were not available. Since, I hardly ever frequent the store, I'd have missed out for sure. To this we say; "But... 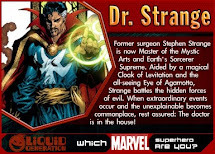 DOCTOR STRANGE...!" ... and that's all that is needed for understanding (or at least begrudging acceptance) to settle in. Oddly enough, because when I originally wrote this blog entry with the first pair of Marvel Boxers, I never thought that I'd ever see another such item again, and so, I padded out the rest of the article with the following silliness. If she were to ring my bell... well... she could take ALL the candy! Anyway, that nonsense with the mannequin aside, these boxers are nifty and everything, but NOTHING would have been cooler to me than if there were Dr. 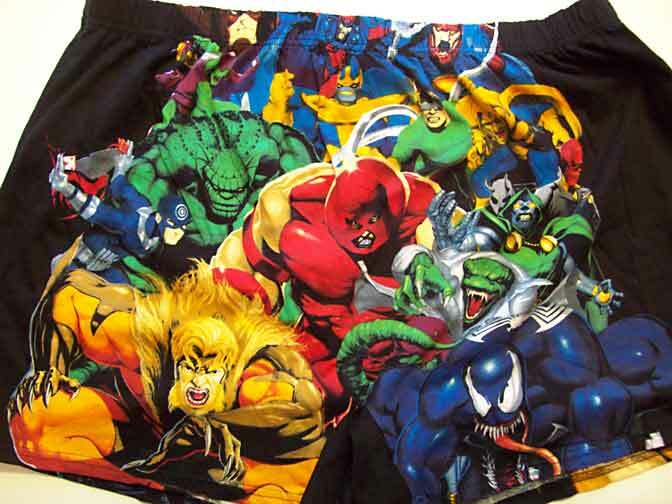 Strange UNDEROOS when I was a kid! C'mon! You all remember Underoos! "Underwear that's FUN to wear"? Another hastily done bit of Photoshop. 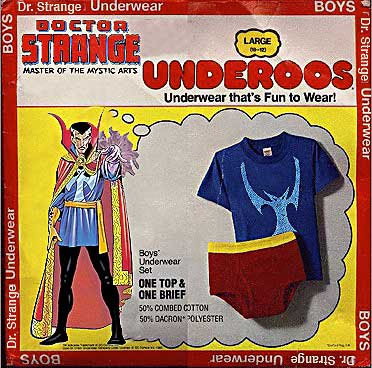 Unfortunately, while all sorts of superheroes were being given the Underoos treatment (Batman, Superman, Aquaman, Wonder Woman, Spiderman, Captain America... all the big hitters), characters like Doctor Strange were left pantsless. At least, until these boxers came along and included him in the pajama party. One day soon, I'll showcase the clothing "accessories" that are in my collection (ie; patches, badges, pins, jewelery and more)! Until then, I will also be continually updating the entries in this series - whenever new items make themselves available. Sorry... these have not been available for many, many years. I bought these over 15 years ago. There are always new styles, for men, women and children on sale at stores everywhere. Target, WalMart, K-Mart, Macy's and many online stores. Just look and you'll be sure to find something. Since the NEW pair are just recently release items, you MAY be able to find a pair at WalMart (or other clothing stores). When I went to my local store, there were none.